We saw robins today. First sign of spring in Vermont. 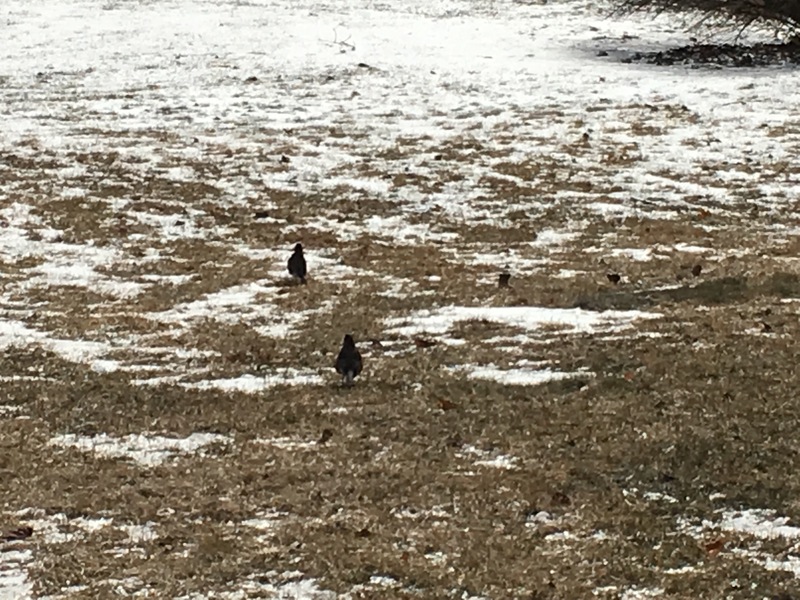 I’m not the best photographer, so you’ll just have to take my word for it that these are robins. Later, I saw Canada geese in a field as I drove by. Another sign of spring. Most people look forward to spring, but this time of year is, honestly, is not my favorite. I love winter. I love it when it snows. I was secretly so happy that it was below zero all weekend. There is still quite a bit of snow in March, in Vermont. We don’t really have a “spring.” Instead it stays very cold through March and into early April, and then we have “mud season” in April and May when everything melts. I like to believe that there is still at least a month left of winter – and there’s some truth to that in Vermont. Everyone else can get excited about robins, and geese flying north. I’m crossing my fingers for a snow day later this week. Join my coauthors and I at Two Writing Teachers for the March Slice of Life Story Challenge! Like you, I love those signs of spring; however, I too am hoping for one more snow day! There’s snow in the forecast here – albeit probably not enough to close schools. There’s always hope, though! What an interesting perspective! I love snow and snow days, too, but hate the bundling that comes with them. Here’s hoping you get your snow day this week! Thanks for sharing! Your reference to “mud season” made me think of the book, Mud, by Mary Lynn Ray. I hope you get your wish for a snow day! Thanks Ramona! I should probably get that book in preparation! Maybe you’ll get some of the Nor’easter that’s going to hit us tomorrow!